The tools pictured here give Raul's the edge when it comes to accurate and complete diagnosis of sophisticated electronic problems. 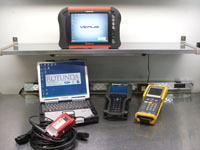 While many aftermarket shops purchase scan tools that work on a variety of makes, these scan tools are often of limited functionality when it comes to diagnostics of systems other than engine controls. 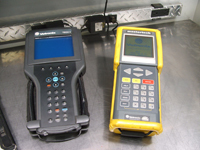 Air Bags, Climate Control, Anti-Lock brakes, and even lighting systems are just a few of the areas where an aftermarket scan tool is just not sufficient to get the job done. On the service of hybrid vehicles in particular, the factory scan tool is just about a requirement. Like many of the factory scan tools, the Ford IDSTM is laptop based. VCM stands for Vehicle Communications Module. This tool works on 1996 and newer Fords including the Escape Hybrid and all of the PowerStroke diesels including the late model 6.4 diesel. It is also the factory tool for Ford Lincoln Mercury and Mazda as Mazda and Ford have a close relationship. The tool is updated EVERY DAY via the internet per a $500 a year subscription we have with Ford Motor Company. 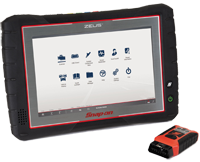 Snap On ZeusTM Diagnostics plus information access in one handheld platform. VERUS puts the answers we need at our fingertips, to manage the complete job from start to finish. With true multitasking and integrated diagnostic functions. We fix it right the first time with VERUS. 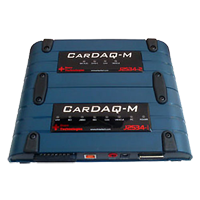 The first fully- integrated handheld diagnostic tool with customer/vehicle records, Scanner, Snap-on Troubleshooter, Component Test Meter, 4-channel lab scope, Fast- Track(R) reference database, and VetronixTM J2534 reprogramming tool for Programming Dodge and Chrysler Vehicles. The Tech 2TM scan tool is the Factory scan tool for GM products including the Saturn Vue Hybrid models, plus the new Aura and Yukon Hybrids as well Hummer. It is also functional on the Duramax diesel trucks. We have had this tool since 2003 and have kept it updated regularly at a cost of $1,200 a year. It works on all GM products back to 1992. Snap-on's deep OEM-specific coverage for 40 vehicle makes Domestic, Asian and European vehicle coverage for vehicles from 1980-current. We have a Wide range of Scanner functions including codes, live data parameters, functional & bidirectional controls & resets/relearns. Deep coverage for many vehicle systems, including engine, transmission, body controls, instrument, ABS, airbag, transfer case, TPMS, and many others. Over a million tips including code tips, symptom tips and more. We do not make random changes to the computer program. Rather, we purchase from the vehicle manufacturer specific computer files that update the existing program to one that is designed to fix faults that have appeared after the vehicle has been sold. Let's say, for example, your car will no longer run on regular fuel without pinging. You have taken it to a repair shop and they have tried various solutions without improving the condition. It is possible that the manufacturer has released updated software to correct the condition in the computer. Raul's has the ability to put that software into your car's computer to solve many problems that cannot be repaired with mechanical or physical parts, usually at a very reasonable price.